There is much that the US Congress can do to help a fishing community like Gloucester. Today I would like to focus our attention on issues of science. Specifically, the existence of the predator-prey model of relationships among fish stocks—and its absence from the deliberations of NOAA and NMFS. When the biomass of predators—here symbolized by mackerel—grows, the biomass of prey— here symbolized by cod—declines. This is a natural behavior that was first mathematically modeled by Alfred J. Lotka and Vito Volterra, a mathematician and a biologist, while studying the cyclical disappearance of anchovies from the Adriatic Sea in the early 1900s. Does not bottom fish cyclically disappear from our shores? This model has come to form the basis for the understanding of chaos theory,2 because, as it can be seen from Figure 1, trends are discontinuous and their reversal occurs abruptly. Predators of today become prey of tomorrow. This model is of immediate comprehension as soon as one sees the larvae of bottom fish, like cod, rising to the surface of the ocean for food—plankton—and light. When they rise from the bottom to the top of the water column, they become a feast for their natural predators, like mackerel, which live in the middle of the water column. Once they grow, codlings need to go back to their friends and relatives—to their natural bottom habitat. While they go to the bottom, codlings offer again a feast to predators that live in the middle of the water column. Codlings have been found in the stomach of mackerel. This is a well-known fact. We hear much of the behavior between the sheep and the wolf in the West; lately, we in the East hear more and more of the same behavior in the relationship between the deer and its natural predators. It was discovered that even lemmings are subject to the same behavior: They do not fall off cliffs to make us laugh. They are being pursued by their natural predators. I was astonished to learn that the underbush and large trees behave in the same fashion. The model outlined in Figure 1 is a simplification of the biological reality, because at the top of the water column other interrelationships are taking place. Even while they are predators of bottom fish, mackerel are in turn prey of seals, tuna, and birds. As can be seen from Figure 2 below, complications arise in this model also because the full cycle is composed of four rather than two phases. 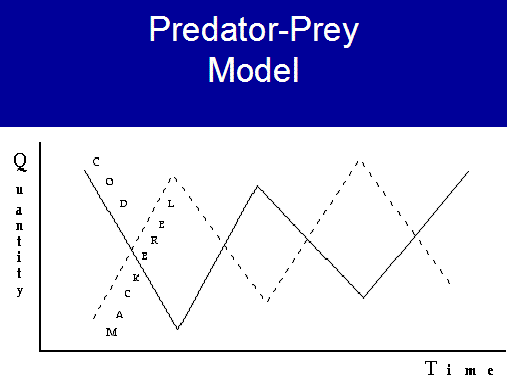 While most of the cycle is taken up by the oscillating phases of predator and prey (regions A and C), during two other phases predators and prey grow together or decline together (regions B and D)3—as in daylight and darkness, more light and more day, more dark and more night. For the biomass, mostly all depends on the availability of food supplies and oxygen. The recommendation that flows from these studies is that the Magnuson-Stevens Act ought to be reformed in such a way as to assure that all decisions concerning fisheries management are, from now on, taken on the basis of full knowledge and respect of the findings of this scientific model of the behavior of fish stocks. Predators in abundant supply need to be harvested in order to protect species that are becoming scarcer and scarcer prey of the moment. This precept ought to drive modern fisheries management behavior—rather than receiving guidance from sporadic and spotty surveys of fish stocks. NOAA and NMFS are trying to do too much. The US Congress should put them in a position to do two things well. Learn and teach us all everything about predator-prey relationships—and control destructive practices of large fisheries operations, leaving the family fishing fleet well alone. 1. Carmine Gorga and Stuart B. Weeks, “Fisheries Renewal: A Renewal of the Soul of Business,” The Catholic Social Science Review, Vol. II, 1997, pp. 145-161. 2. James Gleick, Chaos: Making a New Science, New York: Penguin Books, 1987. 3.Ralph H. Abraham and Christopher D. Shaw, Dynamics—The Geometry of Behavior. Part 1: Periodic Behavior. Santa Cruz, CA: Aerial Press, 1981. *Carmine Gorga, a former Fulbright Scholar, is president of The Somist Institute, a research organization in Gloucester, Mass. Through The Economic Process, To My Polis, and numerous other publications in economic theory and policy, he has transformed economics from a linear to a relational discipline. Dr. Gorga blogs at www.a-new-economic-atlas.com and www.modern-moral-meditations.blogspot.com.